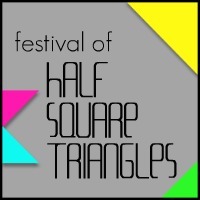 I'm happy to have you visit my blog today as part of the Festival of Half Square Triangles! 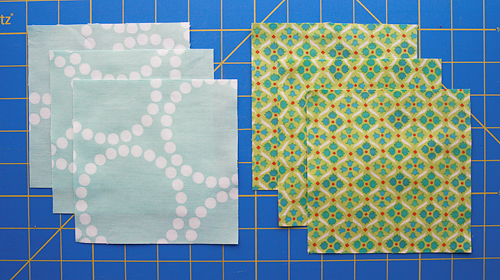 Today I'm going to share a tutorial for a new quilt block and then talk about some ideas for what you can do with it. I almost titled this post "When a Square isn't a Square". Because those are the words that were constantly in my mind as I was creating this quilt block and the quilt that will follow it on Friday. 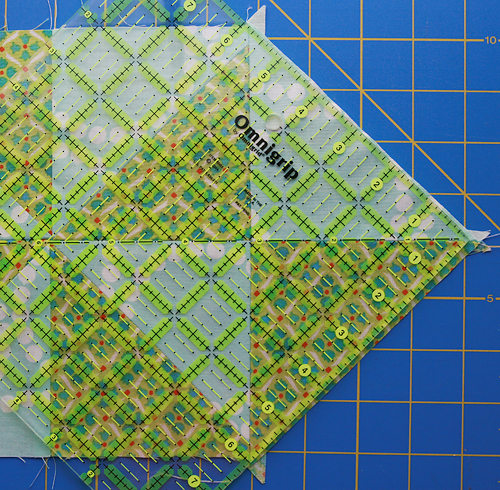 When I'm designing quilts, I think I tend to fall into the mindset that I have to make blocks that are square. But when I sit down and really think about quilts that catch my eye, a lot of the time they are quilts don't use basic squares - whether it be stars or hexies or any number of things. So today's block is a rectangular hexagon. This block can be used on it's own - I actually think it would make an adorable pillow. I could see a bunch of them in different colors all over my daughter's bed. Or it can be combined with many more blocks to make a quilt. 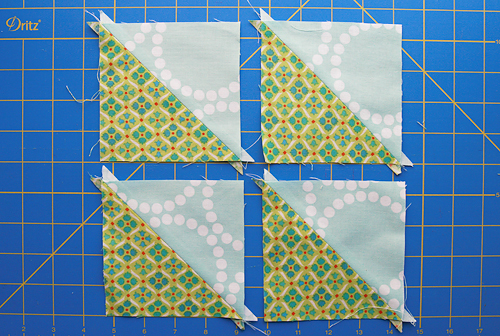 I will share tips for making it into a quilt at the end of the block tutorial. Let's get started on the single block tutorial! Step 2. Cut all 6 squares along the diagonal, resulting in 12 half square triangles (HST). Step 3. Pair 8 of your HSTs together as shown. Sew together along the diagonal creating 4 squares. Step 4. Trim your squares to 4.5" x 4.5". Step 5. 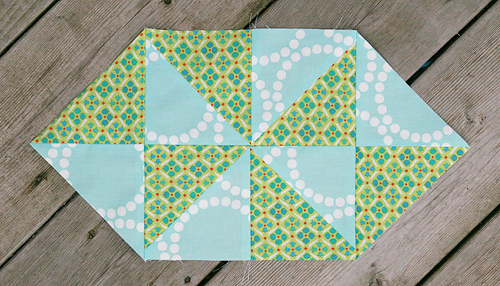 Sew your 4 squares together to form a pinwheel. Step 6. Take your 4 remaining HST. Lay out as shown below. Step 7. 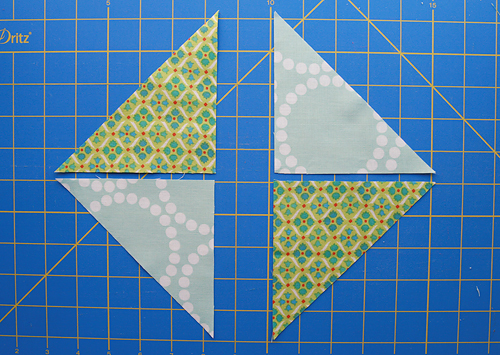 Sew together along the short edge, forming a larger triangle as shown below. Step 8. 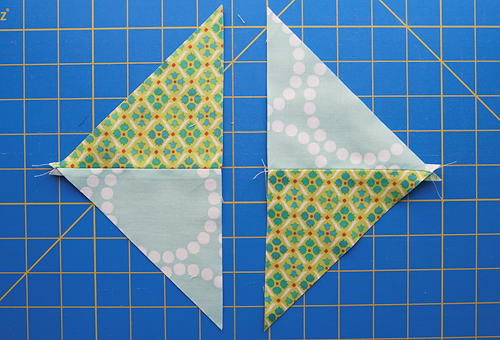 Place these larger triangles on each side of your pinwheel square. Line up the middle seams and sew together. Step 9. 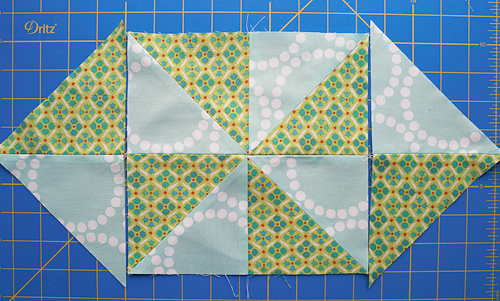 Using a quilting ruler, trim the sides of the resulting block if necessary, so they line up with the edges of the pinwheel section of the block. Congratulations! You've made a Candy Pinwheel quilt block! As I mentioned earlier, I think a block like this would make an adorable pillow. But what if you want a quilt? There are a few options. First, let's talk color and layout. These blocks are staggered to "fit" together. 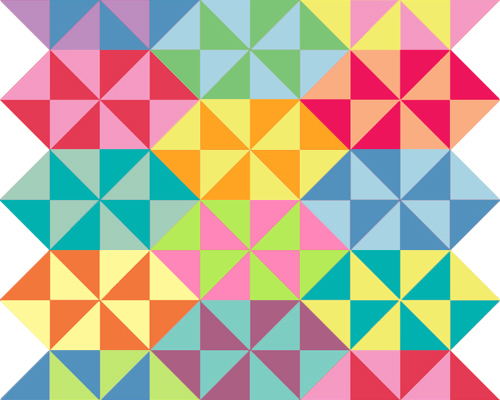 I followed a few color rules when designing this quilt mockup. Almost all my blocks were made using all warm (pink, red, orange, yellow) or all cool (blue, turquoise, green, purple) colors. I think this gives a bit of order to a quilt that is actually scrappy. But there is another easier option. 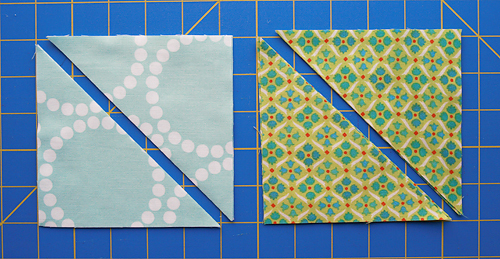 If you plan your quilt ahead, you can actually sew your quilt together in rows. Simply lay out your entire quilt top on the floor or design wall, and rather than making one block at a time, you make one row at a time. You will need some space to make your quilt this way, but I found it to be very easy. I hope that gives you some ideas for making an eye catching half square triangle quilt. I will post my finished Candy Pinwheel quilt on Friday. Here's a sneak peek!